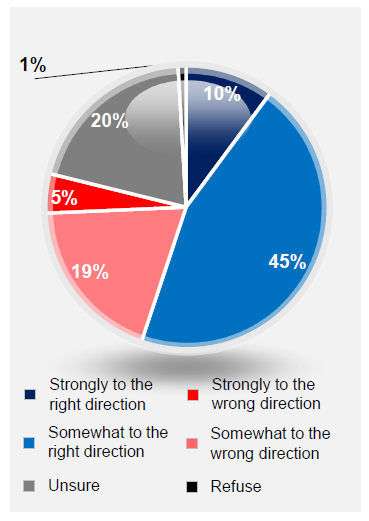 55% respondents feel Malaysia is heading towards the right direction. KUALA LUMPUR (Aug 15): Prime Minister Tun Dr Mahathir Mohamad has an approval rating of 71% among Malaysians as at August this year, according to a post-election survey by the Merdeka Center for Opinion Research. Compared with the election month in May when he scored a rating of 83%, Dr Mahathir’s current approval rating is at its lowest. However, the figure still beats the highest rating of 62% achieved by Dr Mahathir’s predecessor Datuk Seri Najib Razak during his tenure as Prime Minister between 2013 and May 2018. A similar trend can be seen in public perception towards the Pakatan Harapan Federal Government in the August survey. At 67%, Pakatan’s rating has declined from 87% in May — but is still on par with Barisan Nasional’s five-year high achieved in August 2013 during Najib’s tenure. In the bigger picture, 56% of voters were satisfied with the overall performance of the PH Government in fulfilling their election promises to date. On another measure, the percentage of people who feel the country is heading towards the “right” direction has declined to 55% in August, from a high of 64% in May. This compares with 38% in April 2018, the month before GE14. Interestingly, more civil servants (64%) believe the country is heading towards the right direction compared with 60% of respondents in the private sector. Opinion on whether the nation is heading towards the right direction also correlated with the household income of the respondents. Of those earning below RM2,000 per month, 47% opine that Malaysia is heading towards the right direction as opposed to 30% who believe otherwise. For respondents with higher incomes — earning over RM7,000 per month — the ratio was at 68% agreeing and 15% disagreeing. As for measures to address cost of living pressures, 55% of respondents were dissatisfied with the steps taken, against 41% who are satisfied. Only 48% of respondents were satisfied with how the Government intends to grow the economy, while 39% were dissatisfied. On the Government’s economic management, in terms of its ability to address economic challenges, public confidence is still very high at 60% in August — up from 43% in the month before GE14, although it has declined from 65% in July. Inflation tops the concerns of some 57% Malaysians at present. The same sentiment is shared across all ethnicities — except for Chinese respondents who consider corruption as their top priority, with inflation the second biggest concern. Concern over matters related to race and religious rights has increased to 21% in August, from 12% in April. The percentage of Malay voters who think the country is improving has declined to below 50% for the first time since GE14, while sentiment among non-Malays are “stable” at above 60%, according to the research centre. Among Malay voters, above 40% are still dissatisfied with the Government’s position on protecting the interests of Malays and the position of Islam. “[The decline in Malay sentiment is] likely over continued economic concerns [such as] palm oil prices, and heightened use of race and religious rhetoric by the Opposition,” said Merdeka Center. On the performance of key Ministers, Deputy Prime Minister Datuk Seri Dr Wan Azizah tops the chart with an average approval rating of 75%, followed by Economic Affairs Minister Datuk Seri Mohamed Azmin Ali (64%), Home Affairs Minister Tan Sri Muhyiddin Yassin (62%) and Finance Minister Lim Guan Eng (60%). A large discrepancy can be seen between the Lim Guan Eng’s rating among Malays (44%) and non-Malays (84%). Similarly, Attorney General Tommy Thomas was voted by non-Malays as the third best performer (67%), but was least approved-of among Malays (37%). “Heading into the future, the Pakatan Government will face the challenge of managing heightened public expections, an Opposition that is galvanising rhetoric on race and religion, and managing coalition politics,” said Merdeka Center. “The data also suggests that the Pakatan Government faces a Malay electorate that is more cautious when compared to their fellow citizens. “Moving beyond the 100 days, the survey suggests that to win over skeptics, the new Government needs to demonstrate and amplify efforts at addressing the cost of living issues faced by ordinary Malaysians alongside introducing other substantive reform measures on Government service delivery,” it added. The survey was done via telephone on a sample size of 1,160 voters across all 222 Parliamentary constituencies in Malaysia for the Aug 7-14 period in commemorating the 100-day mark since the 14th General Election (GE14) on May 9, the pollster said.